When The Kid was in daycare, they used to serve these huge golden brown corn dogs. You could buy them in massive quantities at Costco and just heat them in the microwave. I won’t name brands but if you ever read the ingredient list on the box, you’d collapse in horror at the science experiment that lurked within. I’ll admit though that they were pretty tasty. The Kid has been asking for corn dogs lately ever since we went to a German festival a couple weeks ago. I have no clue what the heck Germans have to do with corn dogs since I highly doubt they were a German invention, but whatever. It was enough to plant the corn dog seed in her brain. We couldn’t get one while we were out since they may or may not have contained dairy and without an ingredient list, we can’t risk it with her dairy allergy. I got the brilliant idea though to attempt a version at home that wouldn’t cripple our arteries. You bake cornbread and cornbread is on the outside of corn dogs soooooo…. could you bake corn dogs? Yep! You can and I had 5 dogs to prove it. Since I wasn’t in the mood for grocery shopping and had to make do with what I had in the fridge, these corn dogs are actually vegan. This was just by chance and if I’d had non-vegan hot dogs in the house, I would have used those instead. They were really easy to make too. Combine the almond milk and apple cider vinegar in a small bowl and set aside for about 5 minutes to sour. Add the cornmeal, flour, sugar, baking powder, baking soda, and spices to a bowl and toss to combine. Coconut oil is solid at room temperature which is what you want for this recipe. If you are making the corn dogs in warmer weather, refrigerate your coconut oil until it is firm like refrigerated butter. Add the coconut oil to the flour mixture and use two forks or a pastry blender to cut the oil into the flour. This will break the oil into smaller pieces and make the flour crumbly looking in texture. If you’ve ever made biscuits or a pie crust, you know what I’m talking about. Add the soured milk and mix well to combine the ingredients. The batter will form a nice ball of dough as you mix. Place the batter in the refrigerator for about 30 minutes to firm up. Remove the dough from the fridge and roll it out into a rectangular shape that is approximately 1/4 inch thick and approximately the width of a hot dog. I wrapped the hot dog and rolled it under my palms like playdough to seal the seam and even the dough thickness. Then I kinda smooshed the dough shut on one end with my fingers. Repeat with the other 4 hot dogs. Line a cookie sheet with foil and place the wrapped hot dogs on the sheet approximately 2 inches apart. 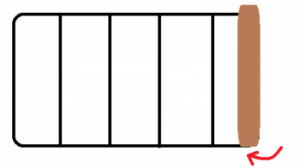 Bake at 400 degrees for 15 – 17 minutes until the coating starts to brown. Remove from the oven and cool slightly before serving. 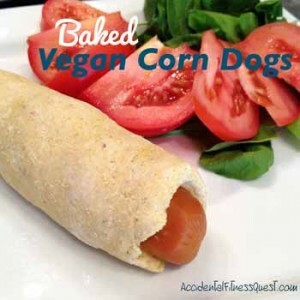 Makes 5 corn dogs at approximately 260 calories each – 16g protein, 31g carbs, and 9g fat. When rolling out the dough, I placed the ball on a large piece of waxed paper and then laid another piece of waxed paper on top. I sandwiched it between the pieces as I rolled to keep it from sticking to the cutting board and the rolling pin. I makes it a snap to clean up. You can also use a little flour to dust the dough with instead but this requires clean up. I learned the wax paper trick a while ago and always use that now. Less mess is best in my book. Yes, corn dogs are usually on sticks. I had no bamboo skewers in the house and only had metal skewers that I use to grill. Since no one wants to hold a 400 degree piece of metal to eat their corn dog, I just eliminated that idea and went stickless. If you have sticks, use ’em if you want. If you prefer, you can use regular milk and butter or margarine in place of the almond milk and coconut milk. Both would work fine. They don’t work for us due to The Kid’s dairy allergy. The Kid was asleep when I worked on the surprise. After I inhaled tasted my corn dog, I secretly hoped The Kid would hate them so that I could have all 5 to myself. 🙁 I had one the next day for lunch and it reheated well in the microwave. I was actually impressed that the coating puffed up around the hot dog just like a real corn dog. I bet you could do these in miniature version too as a great Super Bowl appetizer. Are you as crazy about corn dogs as The Kid is? Are they really a German thing?